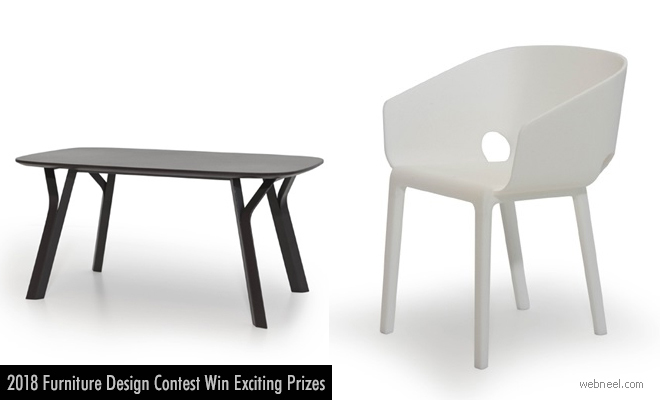 Furniture Design Contest : It's the 19th annual design contest for Andreu world and it focuses mostly on creative seating and innovative table designs. Participants need to create a chair or table with creative designs and quality. New furniture designers are largely benefitted as they are provided with a large international exposure. There is no entry fee. The design contest requires participants to use Beech Wood, Walnut Wood or Oak Wood as the materials for chairs and tables. Veneered Board or Plywood can be used to create table solutions. The contest is open to all design students/ professionals regardless of age and geographical location. The awards ceremony will be held in December 2018. Upon registration in the Andreu Design World Website, participants will be provided with a participant number and for every design they should request a participant number. Will be awarded by a jury composed of professionals from different sectors: Design, Industry, Media and other fields related to creative activities. The jury will also award up to a maximum of 4, non-monetary, special mentions.